Cookies & Candies: What's inside my Hermes Evelyne ? What's inside my Hermes Evelyne ? A Happy New Year to all my readers. Thank you from the bottom of my heart for your support, loyalty and the wonderful heartfelt comments that you've left on my blog. I've made wonderful friends, many of whom I've yet have the chance to meet face to face but each and every one of you have made an impact in my life. Thank you!. I love my Hermes Evelyne. I can safely say it is one of my most used bag next to the Kelly 28cm. The Evelyne is schmooshy like a pillow and an under the radar type of bag yet garners a second look because of its workmanship. I've traveled to Europe and Asia in it. It molds to the body when worn, weighs next to nothing but holds a ton. Just in case you're curious to see how much one can stuff in it, here's a glimpse of the contents of my Evelyne. By the way, this is the petit modele with an exterior pocket, otherwise known as PM2. The Evelyne comes in 4 sizes - TGM, GM, PM and Mini. The new Evelyne PM 3 which comes with an adjustable strap, an improvement from mine currently retails for £1570. I consider it much better value for money if compared to a Chanel 2.55 Jumbo which I believe costs £3100 or thereabouts. Shameless plug - I've got an Evelyne GM in my store for a mere £499 including shipping. A bargain for those who do not want to pay retail price for the same thing. The PM sized Evelyne measures 29cm length x 30cm height and 10cm depth. This is what my Evelyne looks like when I'm with Lil L. I've managed to put all these things inside it with room to spare. The bag is gorgeous! It is on my wishlist. Considering that it's rather open...is it easy to be pickpocket from it? Nothing like a trusty durable to-go bag :) Love this one! I love The Evelyne too! I use way much more than any of my other H bags! What a great post! What colour is your Evelyne? Rouge garance? Quick question: would you find the GM too large for you. I'm 5'4" and am tempted by the Evelyne too! Sarah, Robin, Fashion to Go, Victoria - thank you! It's my to go bag for any casual outings. Cecelia, I've never really had any problems with it. I just pull it towards the front. My wallet is rather wide so it's not so easy to drag it out with things piled on top of it. If you want a durable and comfy bag, I'd say go for the Evelyne. BV interciatto weave is quite fragile. Michelle, for the amount I paid for my other H bags, I barely use them more than once a month. Whereas my Evelyne goes through rain, shine and snow and comes out looking good. S, glad you like them! I-Ping, mine's Rouge H. Actually the GM is not overly big on my 5'2 frame. If you want a larger sized bag, I would strongly suggest you go for the GM. It molds to the body really well so it doesn't look like a massive white elephant hanging next toy our hip. Every time I think I can do without this bag, I see or think of yours. Nope! Must have! Had I read this before ! I'm limbering up for buying my first H bag , and I want to buy an unused one instore as it's the first. Now after months of reading and learning about bags [ I'm a scarf girl really ] I've decided on a Lindy in swift or an Evelyne PM ....either rouge H or gold .And today I had my hands on Evelyne PM in gold , but couldn't decide that it was the one . The Lindy in swift seems unobtainable now, and I find it too heavy in the textured leathers. As soon as I passed a lurking customer bought it : now I'm reading how useful a bag you find it I'm kicking myself ! @Lauraloo, it's one of those bags that doesn't look like much but is ridiculously handy and practical. Gotta get one soon! @Estrella, don't get me wrong, I think Lindy's a stunning bag. 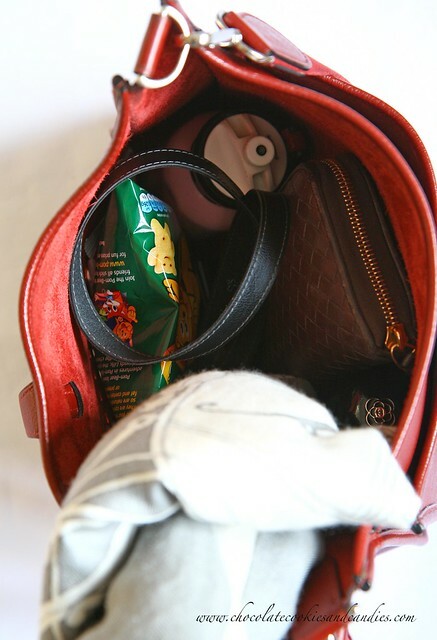 However, it's not very user friendly if you want to be hands free or trying to get something out of the bag in a hurry. 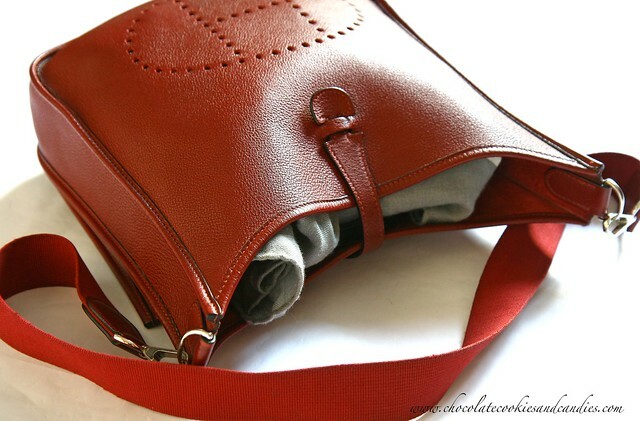 If you get an Evelyne in taurillon clemence, the soft leather makes it so easy to flat pack in your carry on. These days, the 3rd generation Evelynes come with the clasp so you can shorten the strap and wear it on your shoulder. Admittedly, the gold leather is pretty darn hard to get. I saw it the other day when I was in London. Fingers crossed you get lucky again. I laid my eyes on this bag for the LONGEST time in the past few months but walked away from it for no reason. I honestly think it is such a lovely and practical bag at affordable price (for Hermes). Now that I saw your post, it revives my interest in this bag again. @Thu, I didn't think it was possible to consider a red as a good neutral but surprisingly, I reach for it more than others. @Nelah, as I've mentioned in your blog, I'm flattered and touched that you've enjoyed my ramblings. It's the highest compliment a fellow blogger can pay me. The quality of this bag is outstanding. The design is timeless. What I'm shocked is the price. Far FAR less than a Chanel or an "it" bag. 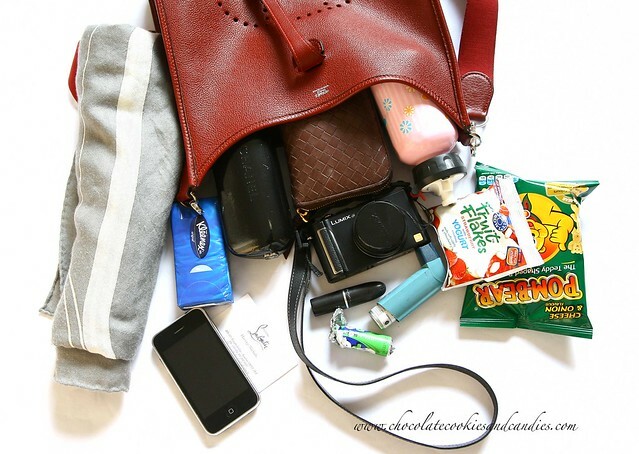 The purse is gorgeous but most of all, I love seeing what other women carry in their purse. Since I have a toddler of my own, I can relate to the need to have snacks and drinks available at all times! Happy New Year! Can I have details of the GM evelyne for sale? Do you ship internationally? Okay. I have seen the picture. Are there more shots to show the condition of the bag? an underestimated but lovely bag you have. personally my fave one is birkin but this one looks lovely for a casual day or a trip as you've mentioned.